Adelbert von Chamisso in 1817 noticed the beautiful California poppy and gave its scientific description and name – Eschscholzia californica Cham. Expedition did not go far inland – flower was noticed and described near the sea at San Francisco. The sight of golden meadows from the ship had to be very impressive. 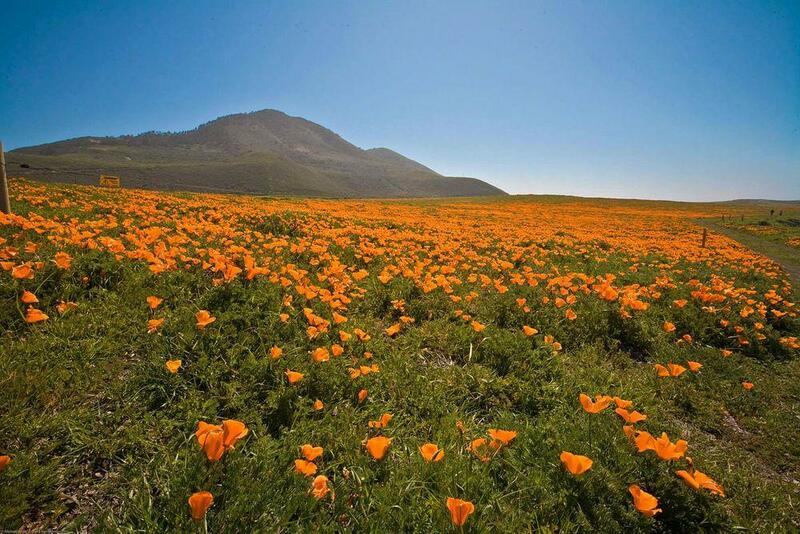 One of the best seaside poppy meadows is located at Point Buchon. 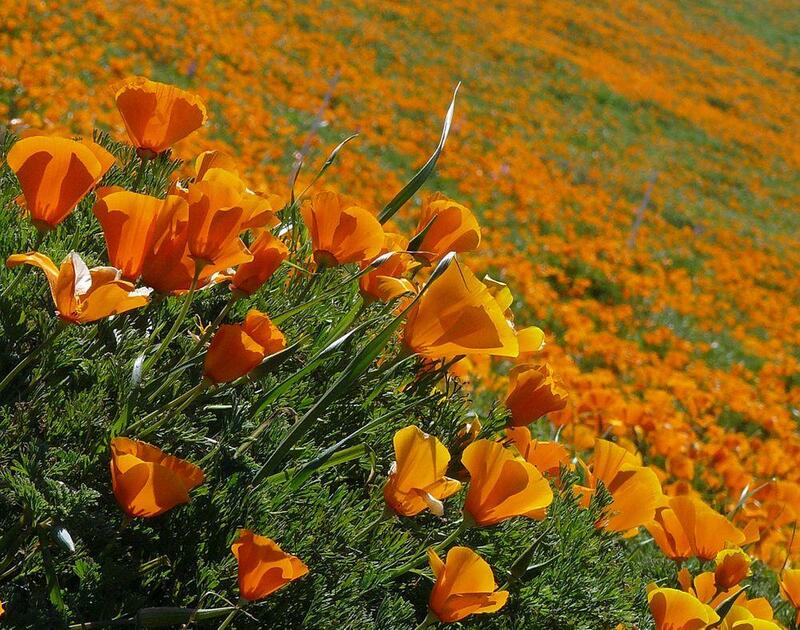 Often in spring this approximately 6 km long and up to 0.8 km wide stretch of the seaside plain is covered with millions of bright orange California poppies. Diablo Canyon Power Plant is a nuclear power plant producing electricity for more than 2.2 million people. 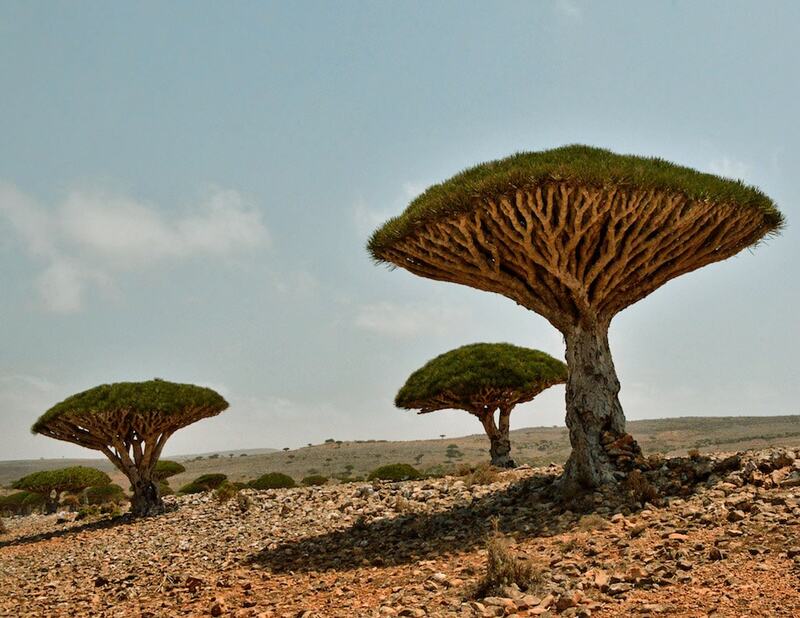 This plant is located at the sea in order to draw water for cooling. 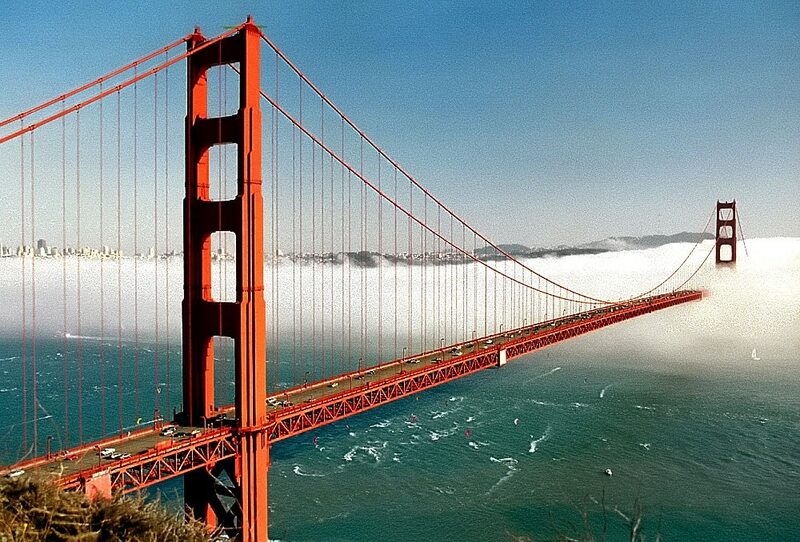 It was built in spite of powerful popular protests in the early 1980s. There is narrow and intermittent strip of meadows between the Pacific and Montana de Oro – former Rancho Cañada. Paved road leads to the power plant from the south and stops in the area of plant. Of course, nuclear power plant is guarded – thus the area north from the plant has few buildings, mostly unpawed roads and a fence. In 2007 – 2008 it was decided that the northern access to Diablo Canyon Power Plant – Point Buchon Trail – can be opened for the public. In fact "Pacific Gas and Electric Co." had to arrange and open this trail in exchange for the permit to build a storage facility for highly radioactive used fuel. The trail leads from the southern border of Montana de Oro State to Crowbar Canyon north from power plant. Access is limited – there can enter 275 hikers per day. Meadows of Point Buchon are beautiful throughout the year but the flowering of poppies makes them very special in late February – April. The first spring in newly opened trail granted unforgettable experience: hillsides were covered with lots of poppies and photographers were busy snatching the sight of rough sea through the golden flowers. Meadows here are not exactly natural – the land was used for growing crops until the late 1940s. Afterwards meadows were grazed, since 1986 land is owned by"Pacific Gas and Electric Co." and is managed by grazing. New Point Buchon Trail opens to public, SanLuisObispo.com The Tribune. Although California is one of states in the United States of America, Americans often compare it to a separate country, e.g. “if California would be a country, it would have the eighth largest economy in the world”. We can go on with this comparison – California has more landmarks and attractions than many large countries of the world. 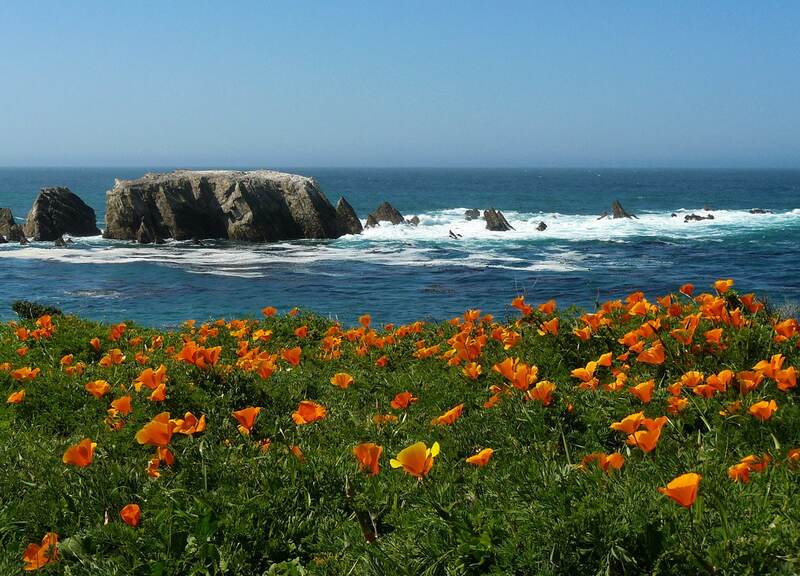 Explore the extensive trail network on California’s scenic Central Coast. The paths within Montana de Oro State Park and Point Buchon are sure to provide many adventures for hikers, cyclists, equestrians and others to explore. Winner of the Best Guidebook Award from Outdoor Writers Association of California! San Luis Obispo County is located where the white sand beaches of Central California merge with the dramatic Big Sur coastline. Ranging inland from the Pacific Ocean are oak-studded hills, verdant farmland, pristine mountain lakes, and the 5,000-foot Santa Lucia Range of the Los Padres National Forest.